The Greensboro Arm Wrestling League is proud to announce that GRAWL Brawl VI: GRAWL-o-ween will benefit the Greensboro Mural Project. The Greensboro Mural Project is an arts organization that uses public art as a tool to communicate, record history, and make Greensboro more beautiful. 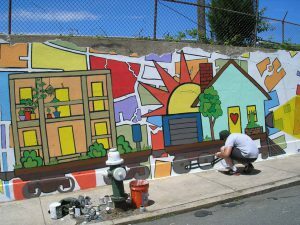 The group uses murals to create dialogue within the community. You can see the Mural Project’s work across town. One prominent mural is the “What Makes Home?” project on Washington Street in front of the Interactive Resource Center (at left). All proceeds from this brawl will go toward the cost of paint and supplies, and the cost of labor to of local artists who will design the mural the group’s queer heroes project. The Mural Project has been interviewing LGBTQ residents to develop the concept for the artwork, which will highlight Queer, trans and cisgender people who inspire change and have kept hope alive in the darkest moments. Tickets will be on sale in October, or can be purchased for $6 at the door on the night of the event, Oct. 21.